Our lighting team at G&R Electrical Wholesalers work closely with leading lighting manufacturers on all types of projects – from factories and schools to pubs and clubs – offering a comprehensive on-site design service for all types of lighting, including emergency illumination. Working as independent electrical wholesalers in Devon and Cornwall, G&R Electrical Wholesalers has developed quickly alongside the ever-evolving LED market, and we now hold the largest selection of LED products in the South West. We’re dedicated to building strong relationships with some of the world’s leading manufacturers in order to offer you the best products and services, so get in touch today if you’d like to learn more. G&R Electrical are determined to be the highest quality lighting wholesalers Plymouth has to offer, providing various LED, energy saving and emergency lighting solutions. We provide products and services in Plymouth, Redruth, Devon, Cornwall, and the entire South West region, allowing customers to have access to the wholesale prices of high quality lighting products accompanied by great customer support and extensive warranties. G&R Electrical Wholesalers is a leading supplier of different types of lighting solutions, offering the largest variety of LED lights in the South West region. Our products are used extensively by lighting retailers, builders, developers, architects, and just about anyone who needs high quality lighting installation solutions. We are the LED lighting wholesalers Plymouth and Redruth trust, providing solutions for LED luminaries for both indoor and outdoor use. With our experience and focus on quality and precision, we continuously excel in the field of lighting supplies across the South West. We have a team of professional engineers who provide help and support to our clients, ensuring you only ever get the best lighting solutions for your project. Our constant attention towards the world’s most prominent environmental challenge has inspired our team to come up with green lighting solutions that increase the productivity and lower operating costs. Going beyond the typical service you might expect from the lighting wholesalers Plymouth has traditionally seen, we are leading the way in a new age of environmental conscious lighting installation solutions to shape the future. As a leader in the LED lighting industry and as premier lighting wholesalers in Plymouth, we have a proven record of helping our client companies in realising the savings and true potential of LED lighting solutions. We work with the leading light manufacturers on various projects for schools, colleges, restaurants, and other commercial premises to offer on-site lighting design services. Through working with different clients, we understand that your needs are unique, and this is why we are ready to work with different types of offices, institutions, and organisations. Our LED tubes, LED bulbs and LED panel lights are famous throughout the South West – so give us a call if you’d like to know more. G&R Electrical Wholesalers offers completely dependable solutions for all your lighting needs. 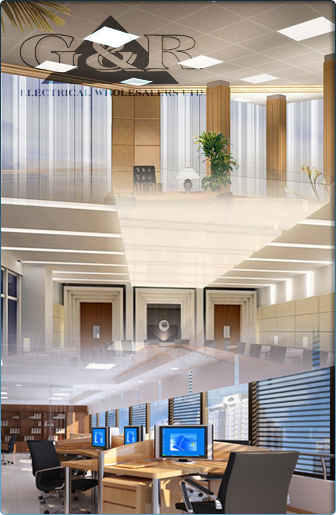 We serve the lighting requirements of offices and homes through better efficiency and longer life, resulting in a lower maintenance costs too. If you are looking for lighting wholesalers Plymouth, we are here to help you – just let us know your requirements and our consultants will come up with a solution.